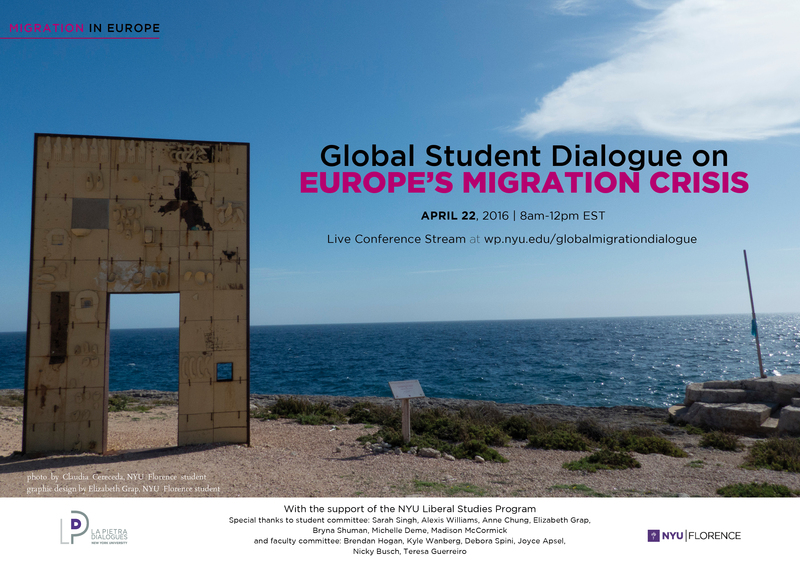 On April 22, NYU Florence will host a global student dialogue on Europe’s migration crisis. Europe’s migration crisis has become one of the most urgent policy challenges of our time. This Global Dialogue brings students from NYU sites around the world together to look at the overall structure of the migration crisis; the responses of national governments, the European Union and international organizations to the crisis; and to analyze the different impacts of the migration crisis on society and culture including public opinion, the media and the arts. The three panels will include panelists located in Florence, London, New York, and Washington, DC. The first panel is Instability in the Mediterranean: The Structure of the Crisis and will provide background; the second, Slow to React? Responses to the Crisis, will explore what has – and hasn’t – been done in response; the third panel, Charting a New Landscape: The Impact of the Crisis on Society, will consider what the implications of the crisis have been thus far and also look ahead. Students from across NYU’s global network can participate in this dialogue. The live conference stream, which also allows viewers to submit questions, is available here. This entry was posted in Florence, London, Students, Washington D.C.. Bookmark the permalink.